December is flying by, much too fast for my taste. Between work and life, holiday preparations, visitors and visiting – there’s so much to enjoy and what seems like so little time to enjoy it! But as always, I’ve been determined to participate in a few extracurricular Christmas activities before they’re gone for another year. Like Glow at Cleveland Botanical Garden. I love the garden and try to visit often – especially in the winter. A walk through the warm, outdoorsy interior feels like a nice little vacation from way too much indoor time. I’ve been to fun events such as Cocktails in the Garden and Orchids After Dark but never Glow. So I was happy for the experience this December. A fun little browse in their lovely gift shop, followed by a long stroll through all sorts of beautifully decorated gingerbread houses and Christmas trees. 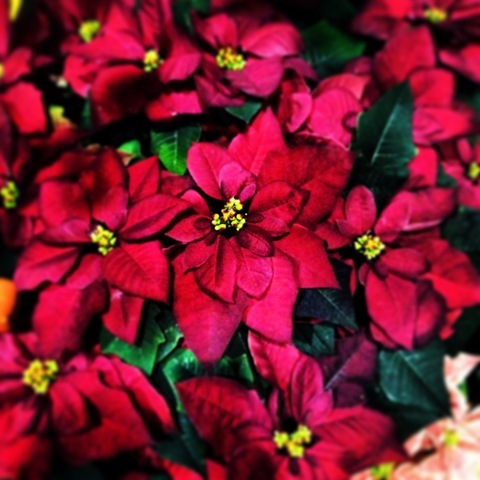 And finally, a little walk through the greenhouses to see their beautiful poinsettias. So festive, so sparkly :). 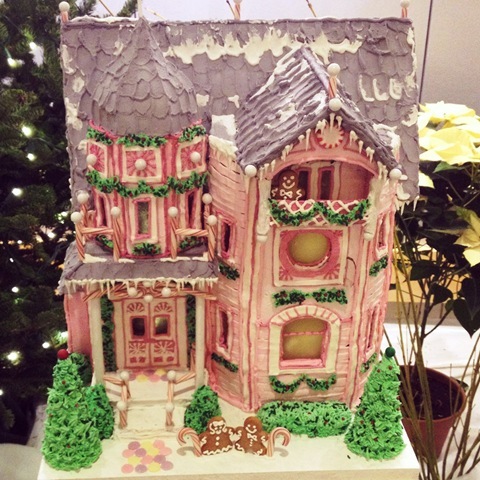 My favorite, a Victorian Gingerbread. How absolutely lovely is that? 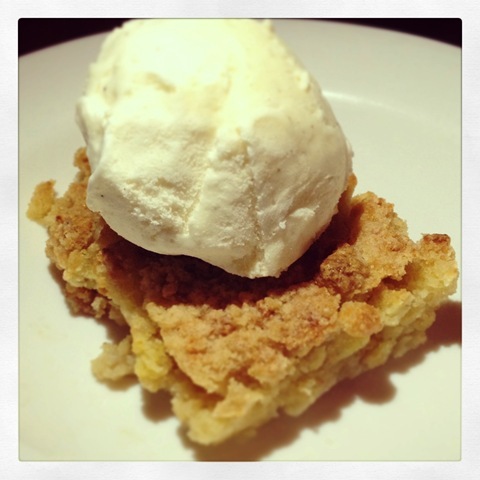 A delightful dinner followed, at Washington Place Bistro’s 2 for $40 Wednesday. Or in our case, 3 for $60 :). It is one impressive special! A shared appetizer and bottle of wine, plus one entree each. I enjoyed my pours of wine with a bowl of Cauliflower Bisque and then Shrimp and Grits. A stick-to-your-ribs kind of meal, perfect for this month of indulgence. Amidst all the holiday hustle and bustle, the evening was a perfect reminder to occasionally stop and smell the roses (poinsettias), just because. How happy the holidays can be. It’s Christmas in Cleveland and holiday traditions are in full swing. One of my favorites, Christmas presents shopping with my mum. And not at just any mall, but the extra lovely Beachwood Place. It just seems to sparkle fancy, no? It’s a hike from where I live but we don’t mind, because it makes the day more of an occasion. Part of our tradition, lunch and perhaps a festive glass of wine at Sixth & Pine in Nordstrom. I love going to Sixth & Pine on a day off from work because for an hour or two I can sit amongst glamorous Ladies Who Lunch, sip Chardonnay and pretend to be one of them. In my dreams. And of course, the food is delightful. 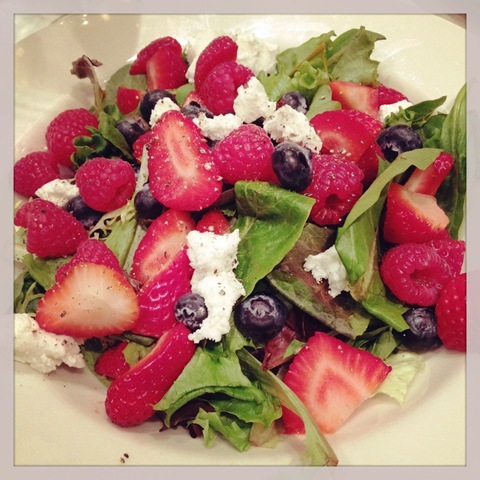 My salad was the daily special, Fresh Berry & Fig Salad with Goat Cheese – organic baby greens and arugula, fresh seasonal berries, dried figs, spiced candied almonds, goat cheese, vanilla bean vinaigrette. Sounds wonderful – and it was as it was – but unfortunately the kitchen forgot the almonds and the figs! Disappointing but they did take it off the bill, so that was something. And of course there is no such thing as a girls’ day out that doesn’t include dessert. A weekly special – chocolate mousse with toffee crumbles, fresh whipped cream and peanut butter caramel sauce. Stop it, really. It was as decadent as you may imagine. So yes, a fancy little afternoon for a girl usually to be found in yoga pants. I don’t imagine I’ll ever achieve ‘Lady Who Lunches’ status but it’s Christmas and so I believe that sometimes, miracles can happen :). Almost more fun than Thanksgiving day itself, the days that fall just before and after. Skipping out of work early, greeting out of town family and friends as they arrive back home, sharing good meals and lots of laughter over special occasion bottles of wine. 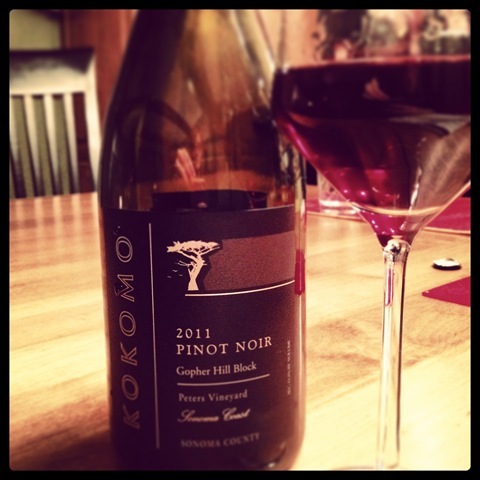 Like Wednesday night’s bottle of Kokomo Pinot Noir, purchased during our May vacation to Sonoma. It was my favorite Pinot of the trip, so I brought a bottle home for my dad on Father’s day. Just as delicious as I could recall! A Pinot that paired nicely with our main, a Lamb Tagine. And finally, a Thanksgiving Eve pumpkin pie pregame – because there’s no such thing as too much of a good thing (right?). We actually cheated here, although I’m very glad we did. As no one would volunteer to be the maker of this year’s pie, Mr. Heinen’s himself (or maybe one of his baker elves) made this one for us to enjoy at home. 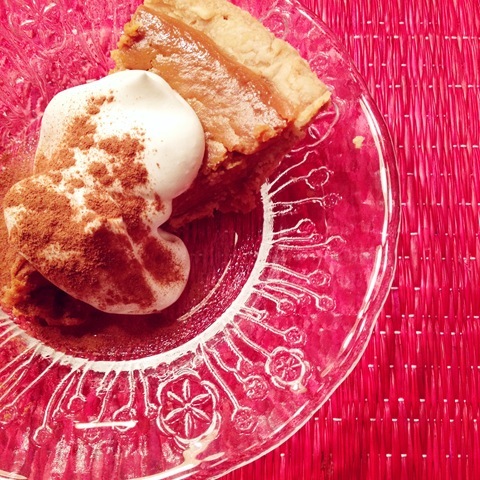 And it really was pumpkin pie perfection! We may never go the homemade route again. Which I think is okay because you can’t do it all, all the time now can you? And in case that’s not enough, a ritual post-dinner voyage to The Brew Kettle for a few delicious craft brews and lots of catching up. Oh the holidays… I love it all. I have a new restauranty love that I’ve just got to share. Well, new to me and potentially some of you – Fat Cats has actually been around for years. Although when left in charge of the restaurant selection I’m always tempted to default to what I know and love, this Friday we were feeling adventurous. And so after a little research I chose Fat Cats, named by Bon Apetit magazine one of the best neighborhood restaurants in the country. Can’t argue that! And a lovely bottle of Malbec to match. Unique little twists on fairly common dishes – my favorite kind of menu. And the right amount of food, so we could taste lots without leaving stuffed. So now Fat Cats has quickly become one of my new choice restaurants in town. Let’s meet for dinner soon :). Well, well, here come the holidays. Unlike some people, I don’t mind a little Christmas before Thanksgiving. Christmastime is beautiful and magical and happy and I see no problem with pulling a little of that inspiration into life prior to indulging in a Thanksgiving feast. The holidays are lovely because, among other reasons, they’re a wonderful reminder to slow down and enjoy the things you love and often forget about. Like Indian Food? Oh yes. I just adore Indian food, such flavor! And it reminds me of our family in England because we all know how much those crazy Brits love their Indian takeaway. 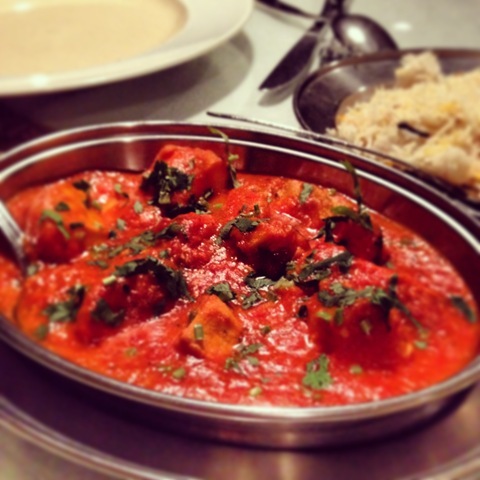 So I was very happy to give Cafe Tandoor a try the other night. Rich Butter Chicken, spicy Tandoori Lamb Masala, fluffy Saffron Rice and pillow soft naan. Indian food heaven. And breakfast! Like a really solid, leisurely long breakfast with friends who make you laugh. I’d heard Horseshoe Casino’s breakfast buffet was quite the fancy feast and the rumors are true indeed. We’re only talking weekday breakfast here and it was an epic spread. Fresh and warm too, which we’ve got to expect from any good meal. Plus $3 mimosas! Who says no to that. 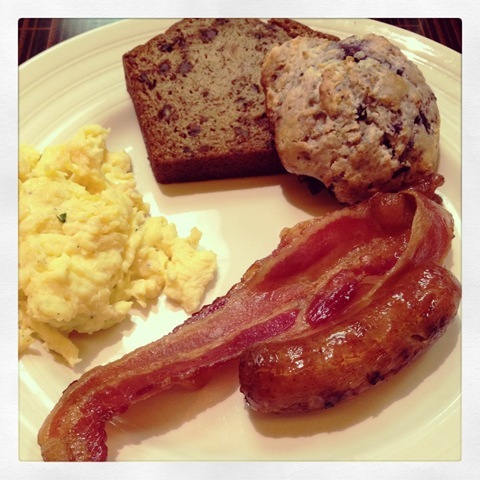 Bring your stretchy pants, plan for a nap – casino brunch is not the fanciest of brunches, but it sure is fun :). And finally, a really good beer. 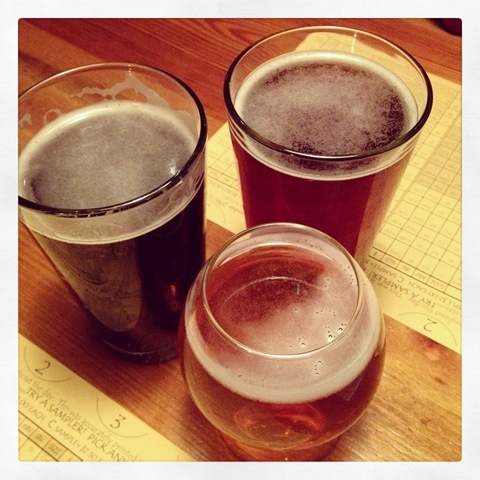 I love craft beer although often ignore it since I also happen to love good wine and cocktails too (help). But happily Streat Burger leaves you with no choice, as beer is their only alcohol offering. But with a 99 Bottles of Beer menu, that’s quite alright! 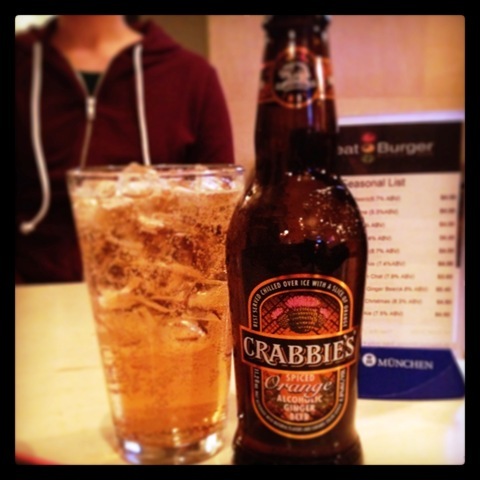 If you like (real) ginger ale then this Spiced Orange Ginger Beer by Crabbie’s has to be one of the best things I’ve tasted of late. What a refreshingly spicy brew! Just an eclectic mix of a few of The Things I Love (and often forget). Happy *almost* Holidays dear reader. For a few weeks there, Cleveland had such a lovely Fall. Bright and sunny and it almost felt like Spring. I’ll take it. But then just like that, we were hit with rain and grayness and this morning – snow! Mother Nature is on fast forward lately. But rain and snow are not so bad when they inspire coziness, especially cozy dishes. Like soup! 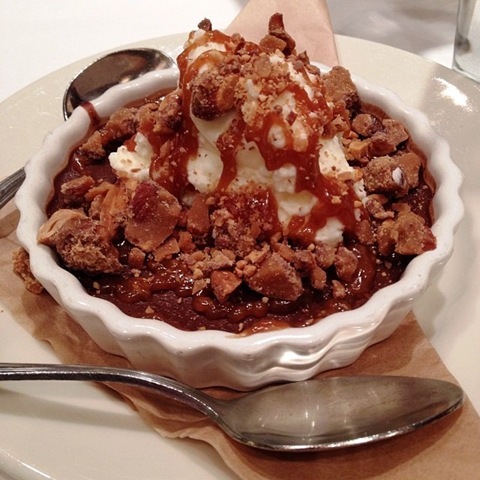 Light yet filling, warming and comforting. And with so many variations, you can almost never get bored. 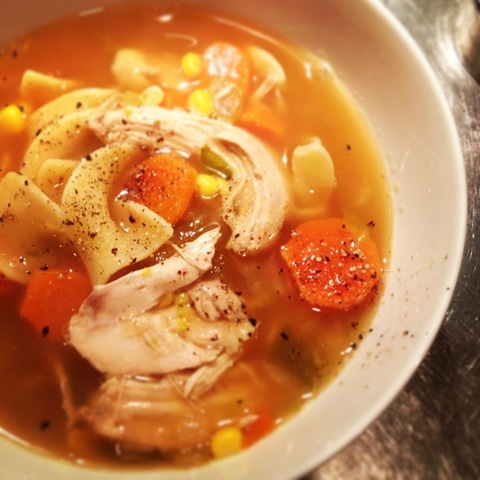 Above, a delicious chicken noodle soup sans recipe. There was enough for several days of enjoyment, only a certain scatterbrain left it on the stove overnight. That was a lot of beautiful soup down the drain :(. But nevermind, for it gave us a chance to try Superior Pho for lunch the following afternoon. And that was a very good move. Banh mi thit – Vietnamese sandwich on a crispy French roll with homemade pate, roasted pork, cucumber, fresh herbs and mayonnaise sauce. Goi cuon – Summer rolls with shrimp, fresh herbs, vermicelli noodles, wrapped in rice paper skin, served with peanut sauce. Pho tai chin – noodle soup with well done brisket and eye-roundsteak. The Banh Mi was fantastic, a great combination of flavors packed inside crispy soft French bread. Summer Rolls are Summer Rolls, fresh and light. I love them, especially dipped in that dreamy peanut sauce. And Pho, served quick and piping hot, packed full of tasty meat and soft noodles. Topped with plenty of Sriracha, guaranteed to make your nose run run :). So yes! 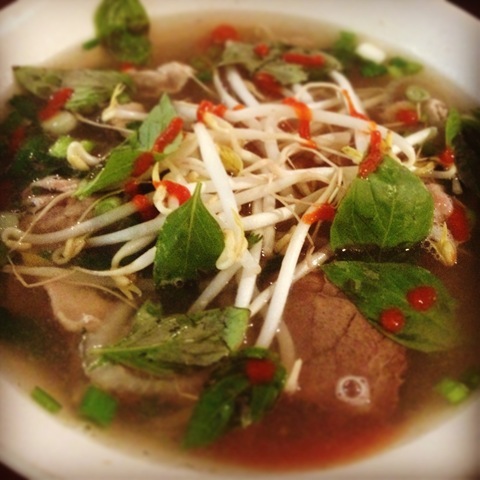 Superior Pho, a bit hard to find although very easy to enjoy. A soupy few days for sure. Except for a perfect vanilla on vanilla cupcake, I’m definitely a non-traditionalist when it comes to food. The more creative the flavors and combinations, the more I want to try things and often, the more I love them. I especially adore really inventive twists on really classic foods. So as you can imagine, this totally unique Hawaiian waffle-burger combination was my foodie dream come true. From the kitchen of Streat Burger in Lakewood, the former home of 56 West. I was sad when I found their doors closed a few months ago, so then very happy to see them reopen again recently. The menu is pick your own protein/base/style so really, the possibilities are endless. The first time we dined there I went more traditional but oh my did I regret that move when I spotted those waffle-burger works of art a few tables down. So tonight, a second chance. 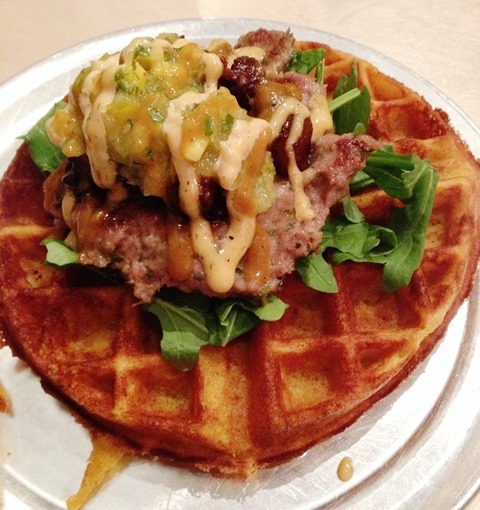 Herb Turkey Burger-Masa Waffle-Pinapple mango relish, sesame teriyaki lardons, habanero aioli, sweet and spicy mustard, greens. A crispy on the outside, fluffy on the inside waffle topped with a party of unique, fresh flavors. Oh yes! Everything I dreamed of. All kinds of deluxe combinations means we can go again and again and never get bored. Although I think I could actually eat this exact combination again and again and never get bored either. I’m sorry I went missing for a while. Changes are on the horizon – although one thing that never changes is the need to eat (delicious food). So let’s meet here again to talk about that and other things, soon.